The 23-year-old, who scored a stunning solo goal in last season's League Two play-off semi-final win over Lincoln City, has had a hip flexor injury. City won eight league games with Boateng fit, but have only won six since he last played on 23 October. 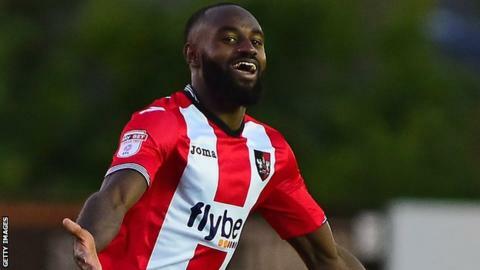 "I see him being a week to 10 days away," Exeter City manager Matt Taylor told BBC Sport. Boateng has returned to training with his teammates, although he has been doing individual sessions focusing on striking the ball. "As much as we can on the training pitch we're getting ready and close to it and we need to get him game time," added Taylor. "Whether that's off the bench with the first team or reserve games, we've got to speed up that process as best we can while still keeping him fit in the meantime. "It's all about the balance with Hiram, but at the moment it's all positive, he's getting through sessions on a daily basis with no issues off the back of that, and hopefully we'll have a clean bill of health for Hiram next week where he can be available for games."